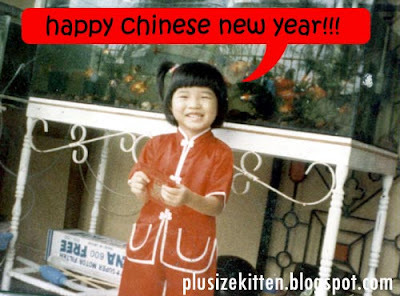 Plus Size Kitten: Happy Chinese New Year! Manage to dig up a picture of me all dolled up for Chinese New Year. I think I'm about under 6 years old in this picture. Can't remember how old but definitely the tadika age still! I'm holding a red packet called "angpao". It's customary for the Chinese (married ones) during the Chinese New Year celebration to give angpao to those who's not married yet, older to younger. Today markes the first day of CNY and I have so far collected many many angpaos from my mom's family side. Going to be rich!!! hohoho..
Red envelopes are mainly presented at social and family gatherings such as Chinese weddings or on holidays such as the Chinese New Year. The red color of the envelope symbolizes good luck and is supposed to ward off evil spirits. The amount of money contained in the envelope usually ends with an even digit, in accordance with Chinese beliefs; for instance 88 and 168 are both lucky numbers, as odd-numbered money gifts are traditionally associated with funerals. But there is a widespread tradition that money should not be given in fours, or the number four should not appear in the amount, as the number itself has a similar tone to the Chinese character for "death", and it signifies bad luck for many Chinese. At weddings, the amount offered is usually intended to cover the cost of the attendees as well as a goodwill to the newly weds. During Chinese New Year, mainly in South China, red envelopes (in the North, just money without any cover) are typically given to the unmarried by the married, only to those who are younger in age. Traditionally, the red envelope is not supposed to be opened until the Chinese New Year festivities are over; otherwise, bad luck would befall the recipient for the whole year. Gong Xi Fa Cai~~ lol you so cute in the picture!!! Jamie..so your saying I should be married a Chinese woman on the Chinese new year while waring red with a hint of yellow and gold and a bit of green but not a green hat! and I should have luck flowing out my ears! sounds like a lot of work and some poor girl would be married to me now that is cruel! my good luck her bad luck! JAMIE....SUCH A HAPPY LITTLE GIRL YOU WERE! aiyoo miu tak sabar already belanja your angpao yea..i rarely got angpao and during raya only my mom will give me angpao. dah besar ni collection semakin sikit LOL. No lah, I believe they bad luck because they don't want their kids to blow all their ang pow money all at one go. So they make this elaborate story to prevent the kids from opening and spending it immediately. So when it is time to open the ang pow the parents will have time to open the ang pow together and take all the money then bank it.